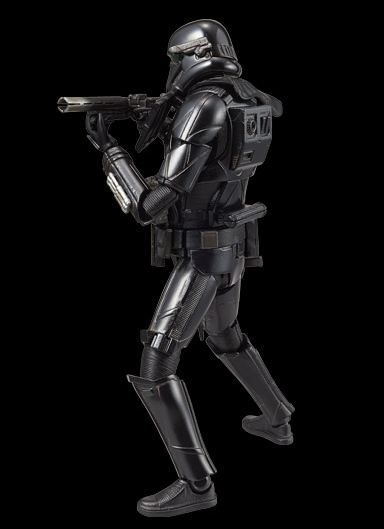 The Modelling News: A new "Death Trooper" from Bandai Models - frustratingly soon not to be available near you..
A new "Death Trooper" from Bandai Models - frustratingly soon not to be available near you.. 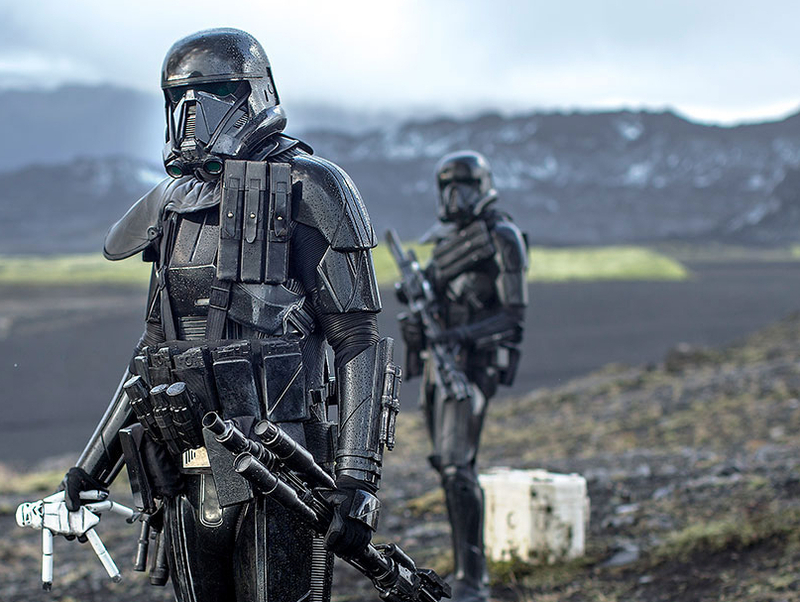 It seems that after the “Can’t hit a barn door” jokes about the original vanilla Stormtroopers, the story writers have gone back to the drawing board with their replacements for the new movie Rogue One: A Star Wars Story. These new soldiers were the vanguard of the Empire at that time. 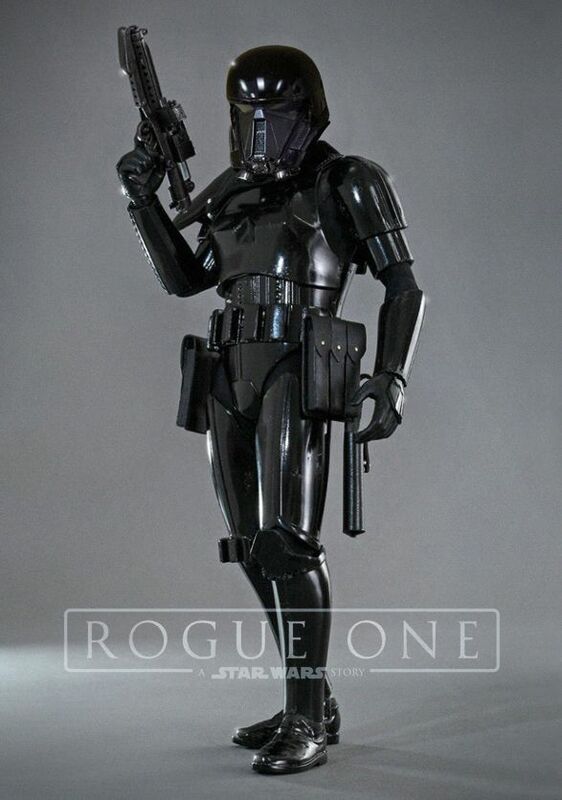 Called “Death Troopers,” they were designed from original A New Hope concept art from Joe Johnston and Ralph McQuarrie. 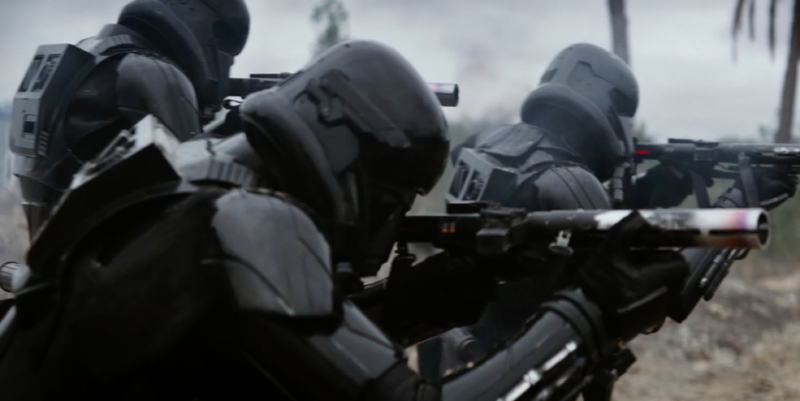 These elite soldiers of Imperial Intelligence, recognizable from their specialized black armour, will make their debut in Rogue One: A Star Wars Story. 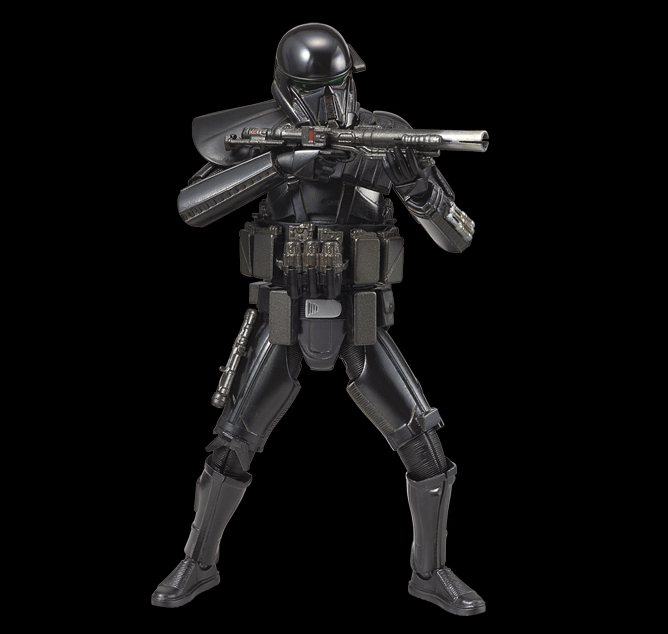 Death troopers were an elite variant of the Galactic Empire's Stormtrooper that were a part of the Empire's Military Intelligence. They wore black suits of armour. 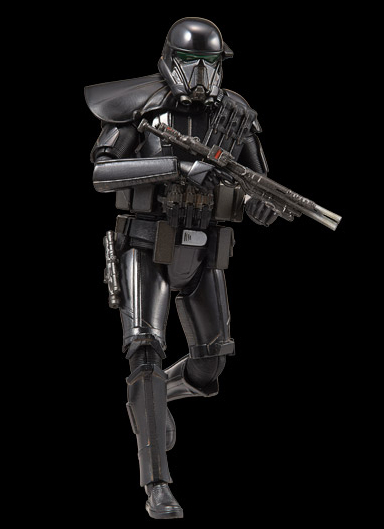 A squad of death troopers served under Director Orson Krennic's command, wielded as his personal weapon against the Rebel Alliance. They were present for the theft of the Death Star plans at the beginning of the Galactic Civil War. 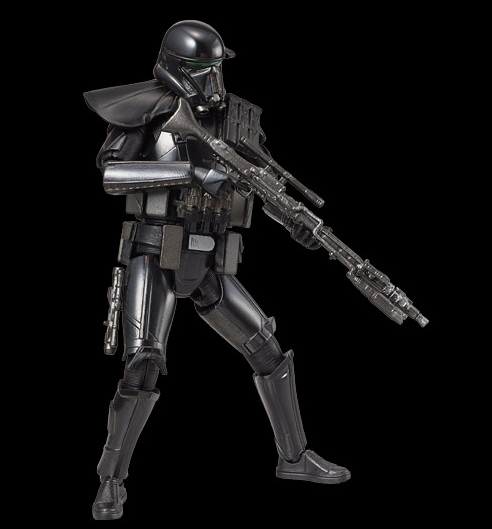 Death troopers were known to wield DLT-19 heavy blaster rifles. 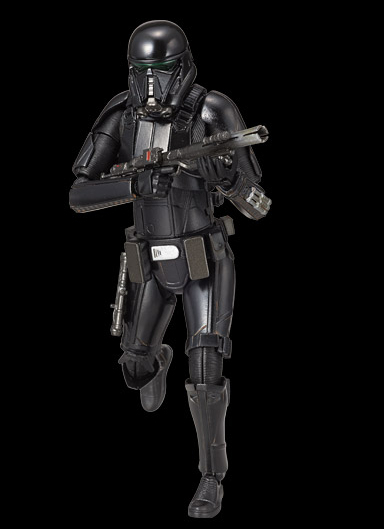 This 1/12 version from Bandai comes with all black armour, a Death Trooper chest pack, a blaster pistol, a E-11D blaster rifle & a DLT-19D heavy blaster rifle, several different hand parts, and a base square for him to stand on. 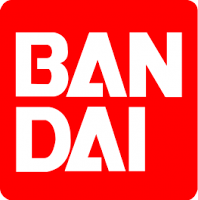 We are sure he could be a great mix with storm troopers and scout troopers in this slowly growing but very popular scale and series from Bandai. Shoulder pads are supplied in black, like the original model Ford pick any colour you want - as long as it's black. ( yes we know that the original Fords were blue). The two different chest packs supplied give you the option of including and mixing and matching several parts so a few different looks can be reproduced. 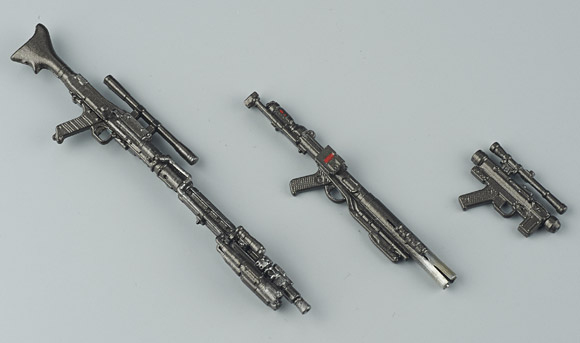 Weapons include a blaster pistol, a E-11D blaster rifle & a DLT-19D heavy blaster rifle so you can further customize your trooper and suit him to the scene. There is also a choice of various hand parts various hand parts, pointing, clenched as a fist, palm open. This will help you show him in a great deal of situations. Lastly, there should be a base supplied with him but we have no sight of this as of yet. 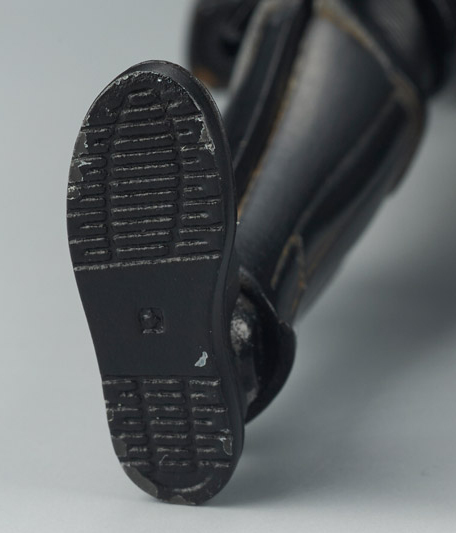 Even the boots have a print on them.